FitSleep was first featured in Wareable's weekly Crowdfund this column where it was successfully funded on Indiegogo, passing its $100,000 goal. Since then, I've chatted with FitSleep creator Xuan Yao who's proudly noted that the device is 95-99% accurate in its sleep tracking. There are two different versions of FitSleep. One has Alpha Wave tech dubbed an 'E-Lullaby' that promises to help you fall asleep quicker by emitting alpha waves, whether it's under your pillow or tucked away under the mattress. The other only monitors sleep. FitSleep's price is a tad higher than other sleep monitors. At $149, the FitSleep tracker without Alpha Waves costs more than the Sense monitor but is the same price as the S+ sleep tracker. For the version with Alpha Waves, you'll be dropping $189. I've been able to test out FitSleep Alpha Wave version to see just how much faster I doze off, and whether the tracking has been accurate. I had a rocky start with the app, and despite updates improving some areas, it's still not the most intuitive interface. The metrics, however, have been generally accurate and on par with Fitbit wearables. That's not to say the whole testing process has been easy to figure out though. Here's the rest of my experience using FitSleep to monitor my sleep. 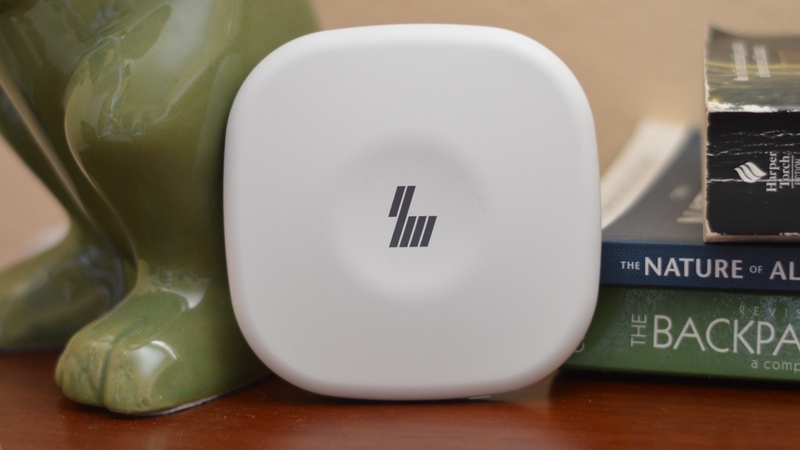 The sleep tracker is a small, flat and very light piece of tech. In fact, you wouldn't believe the company was able to cram any trackers inside after palming the unassuming device. I've never been a fan of the flashing lights heart rate monitors give off when I sleep, and the idea of a big, bulky device sitting on my nightstand tracking my sleep is unappealing. Thankfully FitSleep's design has neither of these things and is the most unobtrusive sleep monitor I've come across. I can't feel it under my pillow at all and definitely forget it's under my mattress. FitSleep can tell when you're in bed through the vibration and pressure sensor - it's able to detect the frequency of your heart rate and sense your breathing vibrations. Apparently the sensors are so sensitive that it can even tell there are two people sleeping in one bed, and detect the right person to track based on proximity. Basically, it will filter out the person further away because the signal is weaker. Two people can't use one device at the same time so you'll need to fork over extra money for a second tracker. The battery life lasts 30 days on a single charge and can be juiced up with your average microUSB cord. There's no battery life indicator on the device itself meaning it won't vibrate and beep at you from under the pillow or mattress. However, I haven't been able to find anything in the app that resembles a battery life indicator either. It's a little annoying not knowing when to charge up the FitSleep, but it's also not a huge deal since it can be easily added through an update. The FitSleep setup is relatively easy - after making sure the device is charged up, press the center button and sync up with the mobile app via Bluetooth. I had trouble finding it this way despite the pairing working once, so I ended up using the camera to scan the QR code. Afterwards, you can leave it in the bedroom where it will collect data when you're sleeping. It doesn't track naps though - just a full night's sleep. FitSleep gives you a rating out of 100 and the higher the number, the better you've slept. You'll also have to manually sync data every morning. I'd prefer it if the FitSleep could sync automatically since I'm a forgetful person, and it's simply more convenient. Over time, the data will accrue and the app will start giving you tips based on your sleep habits. The advice here needs some work though. Under the report tab in the app you can look at a weekly and monthly set of data, but I received contradicting messages. The monthly page says, "Your sleep quality is very good, but you have irregular sleep, please go to bed on time!" That's fair - I do sleep late on occasion, especially when video games are involved. However, the weekly page says, "You sleep extremely regularly, keep it up!" So which is it? Judging from the first time I downloaded the app and finding half of it was in Chinese, I'm thinking it may just be a case of lost translation. If not, the team needs to send more consistent tips. To determine the accuracy of FitSleep, I wore the new Fitbit Charge 2 and Flex 2 since I've found Fitbits to be pretty good at tracking sleep. From the charts, all three devices were able to remain within the same time frames tracking when I fell asleep to when I woke up. The amount of time I was actually asleep has been tricky to figure out. For some nights, FitSleep will say I've slept longer compared to the Fitbits which are missing an hour. It's odd because I can see that the other numbers look close - specifically, the times I've woken up, times I'm restless and again, the times I've fallen asleep and woken up. FitSleep seems to have calculated the sleep duration a little differently than the Fitbits, or it somehow added an extra hour. Again, there are moments of mistranslation within the app that make it difficult to understand what certain metrics mean. For example, FitSleep notes a blue bar as 'Initial' and I'm still unclear about its meaning. Aside from that, the bars indicating deep, light and awake moments match up to other sleep metrics. FitSleep monitors resting heart rate and respiratory rate but a few more tests are needed to verify accuracy. Checking respiration is a bit tougher especially when asleep since it's counting the times you take breaths. This data isn't used in the same way a fitness tracker would use it though, and is instead meant to help the Alpha Wave correctly emit. The waves start working right as you plop into bed. EM (electromagnetic) waves from 1-15Hz emit then scan your body measuring what Yao says is the "exact" frequency of your heart rate and respiration which should then ease you into sleep. Other devices like the Withings Aura uses heart rate and respiration to calculate when best to wake you up, while the aforementioned S+ uses your respiratory rhythm to match the tempo of music it plays while lulling you to sleep. It was hard to discern the sleep efficiency for me since I already pass out pretty quickly. Without another device to measure my sleep efficiency I can't say with certainty that the Alpha Waves worked for me. Additionally, it's odd that for a metric FitSleep tracks, there's nothing in the app that lets me know how quickly I've fallen asleep. If it was clearly noted somewhere, I'd have an easier time figuring it out, but off the cuff, I can't tell. Another feature FitSleep says it provides is a smart alarm. Yao told me, "Because we have the such an accurate device, we can wake you at the exact point where you'll feel most energetic." Setting one is easy, but for some reason, it takes up the whole app and you can't exit the smart alarm screen, which brings me to the next section. The FitSleep app isn't the most intuitive software but it provides a decent amount of information. I noted previously that the update has helped me understand the data better but there are still spots that could use some work. It seems like the tab on the bottom that says 'report' is where your bar graphs live, but those are actually found in the 'diary' section. From there, it's pretty easy to navigate and you just swipe through to see different days. You'll also get links to articles that are sleep related - but there are a few random ones thrown in for some reason. Yao told me that the team will keep refreshing the content over time. If they do, it would be useful to see articles specific to an individual's data - for example, since I sleep so late, perhaps an article on why it's bad for my health to do so. I would note though, there is already a sleep recommendation right above the articles that already does this so it might be overkill to add more. On the other hand, it could also be supplemental for people looking for a more in-depth look at their sleep behaviors. In the same vein of fitness tracker leaderboards, you can follow and share your friend's sleep data. I'm not sure how useful this is considering you can't exactly challenge people to sleep better or provide motivation for it. FitSleep is on the right path to better sleep tracking design, but in use, the device is still a work in progress. Tracking seems to be accurate but there are still a few numbers that don't make sense. It could be a matter of overhauling the app to make sure it's easier to understand. FitSleep isn't too expensive at $189, but it needs to some more work before it's a fully functioning sleep tracker.